Last fall River and I had the opportunity to use and review Logic of English's Foundations Level A program. We've now also used and are reviewing the second book in the Logic of English program, Foundations B. Foundations A was a huge success with River. He absolutely, positively loved the program and really thrived using it. I had planned to buy Foundations B for him once he'd completed A, so the opportunity to get it for a review pretty much made my day (and his ... we happy danced). The Foundations program teaches reading and handwriting to kids aged 4-7. Foundations A ended with River making and reading short books with 2-3 words per page, having learned most of the consonant sounds and one sound for each vowel. Foundations B picks up right where A ends. For this review we received the teachers book and a student workbook in manuscript (cursive is also available). The supplies we'd received with Foundations A - dry erase board, phonogram and writing flashcards, manuscript chart, and game cards - carried over to B and continued to be used. The dry erase board is lined on both sides for handwriting, the writing flashcards are textured so the child can follow the letter and get a real tactile understanding of it, the phonogram cards show the letter on one side and the sounds for that letter on the other, and the game cards allow for a wide variety of games to be played with them. If a child knows most of his basic sounds I think you could comfortably begin with Foundations B, skipping the beginning Foundations A book. However, I really appreciated the way handwriting is taught, beginning in A, and wouldn't want to bypass that. The Foundations program takes about 20 minutes or so per day. I have noticed as we've progressed that the daily work takes a little more time. Most lessons begin with a bit of review, then teach a new letter and how to write it, work on handwriting, and then move to reading and writing words and short phrases. Oh, and tossed in there are silly games to play, fun busy activities that involve running, jumping, patting, sitting, smiling, and more to teach the concepts, and other really cool activities that make both of us laugh and forget we're supposed to be learning something. One day River had to read words correctly, each time he read a word he added a block to a tower, seeing how tall it would get before tumbling over. Another day I read a word to him and he had to write it in chalk on the driveway. As River and I work through the book there are tips for the teacher built into the sidebar. Awesome. When I'm not sure how to help him through an issue (getting that "s" sound right, for example) there's a tip there to keep me going. We've struggled a bit with the short vowel sounds, mostly just remembering which sounds go with which vowel ... according to the tip in the sidebar that's normal, which was very reassuring to read and made me more comfortable. At the beginning of Foundations B River was able to read two to three short word phrases. The whole reading thing hasn't completely clicked for him yet, he still has to sound out each word he reads, not quite catching on when he reads the same word twice or that words that end the same sound the same. By the end of this book set (40 lessons and 8 reviews) he should be able to read whole paragraphs. We do about 3-4 lessons per week. He could do more or less, but this level seems to keep him moving forward and interested. Some weeks we do more, some less. Because the lessons are so fun it's really not like doing schoolwork to River. Please take a look at our review of Logic of English's Foundations A (I just did, and until I read it I'd forgotten how much River didn't like writing and reading when we started ... we've come a long way, baby) as well as this project we did at Christmas using the words he was learning. 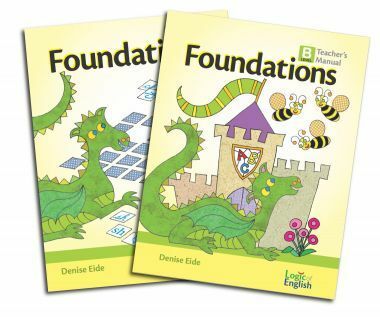 Foundations B hardcover Teacher's Manual ($38.00) and Student Workbook in either cursive or manuscript ($18.00) are available at Logic of English, as are the whiteboard, game cards, and flash cards. Foundations B is geared towards Kindergarten aged children (4-7 years old). If you use, or have used, the Foundations program please comment with your thoughts. Thanks for the lovely review of Foundations! Regarding River continuing in the "sounding it out" phase, I just wanted to encourage you: this is EXACTLY where he should be! Reading doesn't actually "click" and move from reading sound by sound to reading whole words; instead, as decoding the phonograms and blending become increasingly automatic, children's brains process it more and more rapidly until it happens so fast that it looks like they are taking in whole words at a whack. This is what it means to develop fluency. In fact, the brain research shows that when good readers read they are actually still processing individual sounds left to right, not remembering that a word as a whole picture looks like another whole picture that they saw before. So just keep at it; it sounds like he's making fantastic progress! If you took a break for the summer, you'll want to spend a bunch of time reviewing the phonograms before moving on, but all that will continue to work together so that he masters the phonograms and develops fluency as a reader. Again, thanks so much for your review, and best of luck with your homeschooling this fall! This is a fantastic review, and told me exactly what I needed to know. We reviewed Foundations A and are ready to move on, and I was trying to decide between springing for Foundations A and using another program I already have the "middle" level of. I think you've convinced me to go ahead and keep up with Foundations! Thanks so much!